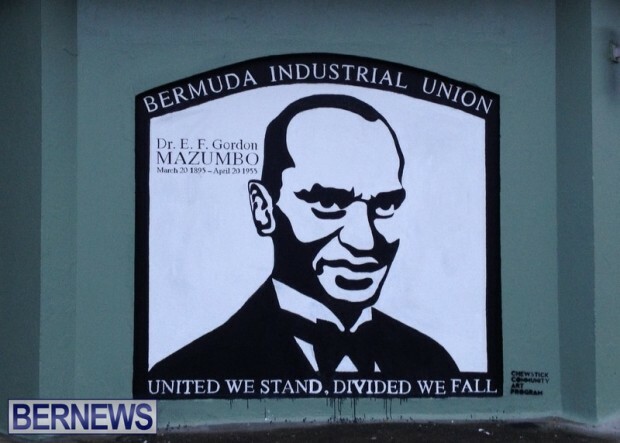 Imagine Bermuda, in collaboration with the Department of Community and Cultural Affairs and the Chewstick Foundation, is getting set to present a celebration of the 120th anniversary of the birth of national hero Dr. E.F Gordon on Friday [Mar 20] at City Hall between 12.00pm and 1.00pm. The program at City Hall will include presentations, music, and spoken word by students from Berkeley, Bermuda High School for Girls [BHS], CedarBridge, Mount Saint Agnes, and Saltus. In addition to this focus on youth, the event will feature the iconic Gene Steede. A spokesperson said, “This celebration is in appreciation of the person, as well those many residents who played a part in the movement that he inspired. Dr Gordon’s courage and selflessness galvanized that movement which paved the way for a democratic Bermuda. “In 1944, Dr. Gordon responded to a request from artisans building the U.S. Bases, who had formed the Bermuda Workers Association [BWA], to address matters of pay. With visionary leadership, he expanded the conversation to address the big picture. “At a time when the electorate was restricted to less than 3,000 voters, that movement involved more than 5,000 residents considering a variety of issues. The matters of pay, segregation, education, health and the right to vote were addressed in a petition which Dr Gordon took to London in 1946. Champion and freedom Fighter…….and Grandfather of my Son …Karriem Akbar Sharrieff and I pray that Allah blesses him with the same courageous heart …. Allah-u-Akbar…! United We Stand Divided We Fall !! 70 years later, same S! @# different day !!!!!!!!!!!!!!!!!!!!!!!!!!!!!!!!! If what you say is true then why do we celebrate this great man? I think you do him a diservice. Thank you BIU keeping this on file for us. Your credibility was lifted a few notches for me personally. This audio file is priceless and every Bermudian should have knowledge of this. As a professional, your credibility will be lifted tenfold if you thought a little bit differently. In order for me and my peers to have greater respect for the BIU please consider these suggestions and those that are akin. Become a better team player. Your motto “United We Stand, Divided we Fall” applies to the island as a whole; using it for BIU causes encourages division among the greater whole. In this delicate time, our country needs leaders that can bring the community together. I believe that Dr. Gordon would work more for unity if he were alive today. Work to formally educate and integrate the impact of historical figures such as Dr. Gordon, Dr. Ball and others in curriculum (private and public). We should have mandated Bermuda history (black and white) in our school books that accurately reflect life in Bermuda. The BIU have a big responsibility for this to ensure that our society doesn’t forget or ignore where it came from. Work with groups like the Bermuda National Trust and the Bermuda National Museum to preserve our heritage (black and white) and seek more to educate us about race and work relations in Bermuda. Your website and headquarters can become interactive and gain much visitation with the right visionary. Become the voice for our Asian guest workers who are treated the same way many blacks were in the 1940s. Many of them have living and wages that are deplorable. Yet business is allowed to exploit them. Bring their plights to light. I believe the gist of my ramblings is evident. My request is that you take the time to become relevant to not just blue-collar workers, but to white-collar Bermuda too. Your force and credibility at that time will not be denied.